On this first day of the Great Pentecost Novena, I find it helpful to reflect on the Blessed Virgin Mary’s participation in the Most Holy Eucharist. It is inconceivable that the Apostles, gathered in the Cenacle around Mary, the Mother of Jesus, would not have obeyed the commandment of Our Lord given in the same Cenacle on the night before He suffered: Do this for a commemoration of me” (Luke 22:19). Père Réginald–Marie Garrigou–Lagrange, O.P. treats of this in his book, The Mother of the Saviour. It is most becoming to insist here a little on what Holy Mass and Holy Communion, received from the hands of St. John, must have meant for Our Blessed Lady. Why had Mary been committed to St. John on Calvary rather than to the holy women who were also at the foot of the Cross? The reason was that St. John was a priest and had a treasure which they could not give her, the treasure of the Eucharist. Why among the Apostles was John chosen rather than Peter? One reason is that John alone remained at the Cross, drawn and held there by a strong sweet grace. Another is that he is, as St. Augustine remarks, the model of the contemplative life, of the interior and hidden life which had always been that of Mary and which would be hers till death. Mary’s life will be cast in a very different mould from that of Peter, for she will have no share in ruling the Church. Her vocation will be to contemplate and to love Our Saviour in His sacramental presence, and to obtain by her unceasing prayer the spread of the faith and the salvation of souls. She will be thus in a very real sense the heart of the infant Church, for none other will enter as she into the depths and the strength of the love of Jesus. Let us consider her in this hidden life, especially at the hour when John celebrated Holy Mass in her presence. Mary has not the priestly character; she cannot perform the priestly functions. But she has received, in the words of M. Olier, “the plenitude of the priestly spirit,” which is the spirit of Christ the Redeemer. Thus she is able to penetrate deeper than St. John himself into the meaning of the mysteries he celebrates. Besides, her dignity of Mother of God is greater than that of ordained priest; she has given us both the Priest and the Victim of the sacrifice of the Cross and she has offered herself with Him. Holy Mass was for her, in a degree we can only suspect, the memorial and the continuation of the sacrifice of the Cross. A sword of sorrow had pierced her heart on Calvary, the strength and tenderness of her love for Jesus making her suffer a true martyrdom. She suffered so much that the memory of Calvary could never grow dim, and each Holy Mass was a fresh renewal of all she lived through there. Mary found the same Victim on the altar when John said Mass. She found the same Jesus, really present; not present in image only, but in the substance of His Body with His Soul and Divinity. True, there was no immolation in blood, but there was a sacramental immolation, realised through the separate consecration of the bread and the wine: Jesus’ blood is shed sacramentally on the altar. How expressive is that figure of His death for her who cannot forget, for her who bears always in the depths of her soul the image of her Son, outraged and wounded, for her who hears yet the insults and the blasphemies offered Him. St. John’s Mass, with Mary present at it, was the most striking memorial of the Cross as it is perpetuated in its substance on our altars. It is the same Victim who is offered at Holy Mass and who, in Heaven, offers His glorious wounds to the Heavenly Father. The Body of Christ never ceases to be in Heaven, it is true. It does not come down from Heaven, in the strict sense of the terms, on to the altar. But, without being multiplied. It is made really present by the transubstantiation of the substance of the bread and the wine into Itself. There is the same principal priest, or offerer, in Heaven and on earth also, “always living to make intercession for us.” (Heb. 7:25). The celebrant of the Mass is but a minister who speaks in Jesus’ name. When he says “This is my body” it is Jesus who speaks by him. It is Jesus who, as God, gives to the words their power of transubstantiation. It is Jesus as Man who, by an act of His holy soul, transmits the divine power and who continues to offer Himself thus for us as principal priest. If the human minister ever happens to be slightly distracted, the principal Offerer is not distracted, and Jesus as Man, continuing to offer Himself sacramentally for us, sees all that we miss—sees all the spiritual influence exercised by each Mass on the faithful present and absent, and on the souls in Purgatory. Jesus continues to offer Himself in each Mass, the actual offering being made through the hands of His minister. The soul of the sacrifice of our altars is the interior oblation which is always a living reality in His Sacred Heart; through that oblation He applies to us continually the merits and satisfaction of Calvary. The saints have sometimes seen Jesus in the priest’s place at the moment of consecration. Mary knew the full truth better than any of the saints. Better than any of them she knew that the soul of every Mass was the oblation that lived in her Son’s Heart. She understood too that when, this world having reached its term, the last Mass,would have been said, Jesus’ interior oblation would continue for ever, not now as supplication but as adoration and thanksgiving—as the eternal cult expressed even now at Mass by the Sanctus in honor of the thrice-holy God. How did Mary unite herself to the oblation of Jesus, the principal priest She united herself to it, as we shall explain later, as universal Mediatrix and CoRedemptrix. She continued to unite herself to it as at the foot of the Cross—in a spirit of adoring reparation, in petition and thanksgiving. Model of victim-souls, she offered up the anguish she suffered at those denials of the divinity of Jesus which prompted St. John to write his fourth Gospel. She offered thanks for the institution of the Blessed Eucharist and for all the benefits of which It is the source. She prayed for the conversion of sinners, for the progress of the good, for the help the Apostles needed in their work and their sufferings. In all that Mary is our model, teaching us how to become adorers in spirit and in truth. 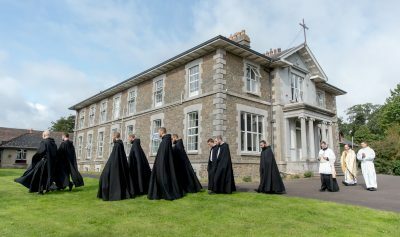 What shall we say of Mary’s communions? The principal condition for a fervent communion is to hunger for the Eucharist. The saints hungered for It. 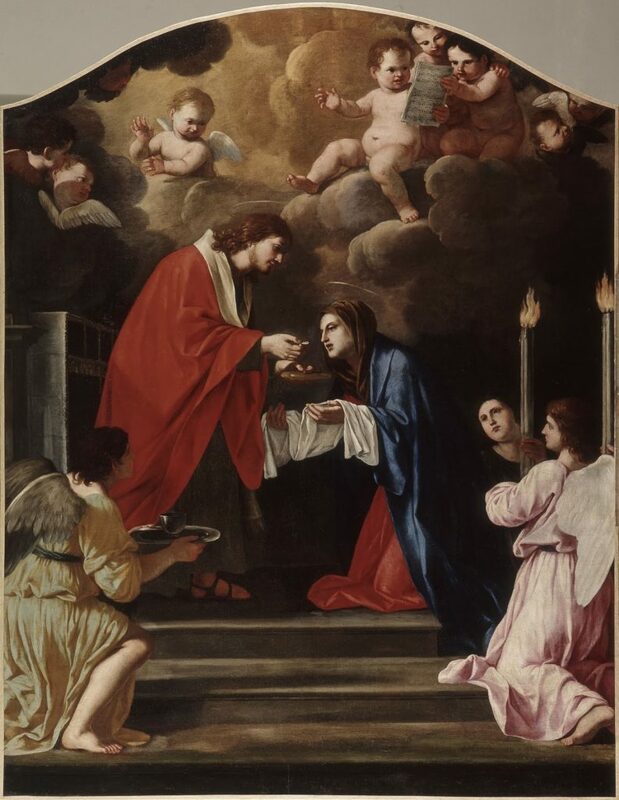 When Holy Communion was denied St. Catherine of Siena, her desires obtained that a portion of the large Host broke off unknown to the celebrant and was carried miraculously to the saint. But Mary’s hunger for the Eucharist was incomparably greater and more intense than that of the saints. Let us contemplate reverently the strong loving desire which drew Mary to Jesus in the Blessed Sacrament. Every soul is drawn towards God, for He is the Sovereign Good for whom we have been made. But the consequences of sin—original and actual—and of innumerable imperfections make God appear unattractive in our eyes and weaken our inborn desire for union with Him. Mary’s soul, however, knew nothing of the consequences of sins and imperfections; nothing ever checked the Godwards tendency of her wonderful charity. Forgetting herself, Mary turned firmly towards God, with a firmness that grew daily as did her merits. The Holy Ghost dwelling in her moved her to give herself to God and to be united to Him. Her love of God, like an intense thirst, was accompanied by a sweet suffering which ceased only when she died of love and entered on the union of eternity. Such was her desire of the Eucharist. Jesus for His part desired most ardently to consummate Mary’s holiness, to communicate to her the overflowing riches of His Sacred Heart. If He could suffer in glory, He would suffer from the resistance we offer to the same desire He has in our regard. But He found no resistance in Mary. And so He was able to communicate Himself to her in the most intimate way possible for two lives to be fused into one on earth: Jesus’ union with Mary was a reflection of the sanctifying union of the Word with the Sacred Humanity, an image of the communion of the Three Divine Persons in the one infinite Truth and the one limitless Goodness. Mary became again the pure living tabernacle of the Lord when she communicated—a tabernacle which knew and loved; one a thousand times more precious than any golden ciborium; a true tower of ivory, house of gold, and ark of the alliance. What were the effects of Mary’s communion? They surpassed anything St. Teresa recounts of transforming union in the Seventh Mansion of the Interior Castle. Transforming union has been compared, in its power to transform the soul in some way into God by knowledge and love, to the union of fire with a piece of iron, or that of light with the air it illumines. Rays of supernatural warmth and light came forth from the soul of Jesus and communicated themselves to Mary’s intellect and will. Mary could not take the credit to herself for the sublime effects they produced in her. Rather did she give praise on their account to Him who was their principle and end: “He that eateth me, the same also shall live by me;” he who eats my flesh lives by me and for me, just as I live by my Father and for my Father. Each of Mary’s communions surpassed the preceding one in fervour and, producing in her a great increase of charity, disposed her to receive her next communion with still greater fruit. Mary’s soul moved ever more swiftly Godwards the nearer she approached to God; that was her law of spiritual gravitation. She was, as it were, a mirror which reflected back on Jesus the light and warmth which she received from Him; concentrated them also, so as to direct them towards souls. In everything she was the perfect model of Eucharistic devotion. If we turn to her she will teach us how to adore and to make reparation; she will teach us what should be our desire of the Blessed Eucharist. From here we can learn how to pray at Holy Mass for the great intentions of the Church, and how to thank God for the graces without number He has bestowed on us and on mankind.